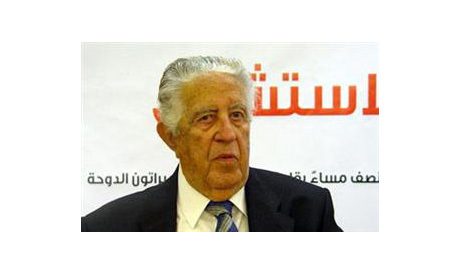 Influential Egyptian write and thinker Anouar Abdel-Malek, known for his devotion to pan-Arabism, passed away in a Paris hospital on Friday night. He was 88 years old. Anwar Mogeith, professor of philosophy at Helwan University, described the loss of Abdel-Malek as a “loss to modern Egyptian thought,” referring to his project to develop and adapt Marxism to an Egyptian context. Mogeith had been a friend of Abdel-Malek since the 1980s, when he studied in Paris. Abdel-Malek died in Paris and was buried in his home country. Abdel-Malek wrote extensively and critically about communists in Egypt at the time. His main criticism was their failure to Egyptianise leftism. Mogeithdescribes how Abdel-Malek addressed the Egyptian secular opposition and its poor relations with the Islamists, calling for them to develop a strong national front, although he himself was not in agreement with Islamist thought. The notion of the ‘pan-Arab state’ permeated Abdel-Malek's work. It was this, Mogeith explains, that lay behind his enthusiasm for Mohammed Ali's project of renaissance and Abdel-Nasser's projects, such as unity with Syria in the 1950s. Later, Abdel-Malek fled Nasser’scrackdown on communists and socialists, travelling to France in a boat and nearly losing his life in the attempt. Keenly attuned to the work of the Zionist Lobby, Abdel Malek described Israel as racist and imperialist state. In his work, he also explored questions of orientalism, well before the seminal Orientalism by Edward Said published in the late 70s. But it was not until Said’s book that attention was paid to these arguments in broader circles. On another front, historian Sherif Younis sees Abdel-Malek at the forefront of national Marxist thinkers in support of national freedom. He also said that their role had declined in the public sphere following the decline of Nasserism, however. Younis explains that Abdel-Malek’s support of Nasser's nationalist project was based on his belief in it. Although he himself did not directly benefit – he had to leave Egypt – he continued to support Nasser’s project based on shared principles. Poet Shabaan Youssef explains how Abdel-Malek had become particularly sensitive to criticisms of his column in Al-Ahram newspaper, which he was keen to maintain until the end as a means of communicating with his readers. According to Youssef, a recent book by Hamza Kenawy, written two years ago and entitled ‘Intellectuals,’ had included criticism of Abdel-Malek, even though he had worked as the Abdel-Malek’s private secretary. This caused Abdel-Malek severe distress. On his Facebook page, Kenawy expressed his sorrow for the loss of Abdel-Malek, describing the day of his death as “a disaster” in his own life. Abdel-Malek was born in 1924, received his bachelor’s degree in philosophy in 1954 from Ain Shams University and his PhD from the Sorbonne in France. His academic career started his work as a professor at the National Research Centre in France, and he became head of research in 1970. He was also a professor of sociology and political science at the Faculty of International Relations at Rizzo University in Japan, and worked as a consultant for Asian Affairs at the National Centre for Middle East Studies in Cairo. He was also honorary head of research at the National Centre for Research in Paris, as well as a member of the International Union for Sociology, of which he served as deputy head from 1970 to 1978. He also headed a project at the UN University from 1976 to 1986. Abdel-Malek’s Egypt: Military Society is perhaps his best-known work, and continues to be widely cited today. It is perhaps ironic that a man most known for his description of Egypt’s development as a military society should die in the midst of what many are describing as a military coup.